Once, there were two brothers born nine months apart in the same room of the same hospital in the same manner—the protracted period of ill-timed contractions, the doctor in blue scrubs and white mask, the late-night crowning, the father’s kiss, the death of the mother. And with each child’s arrival and each mother’s passing, the father celebrated and mourned in the only way he’d ever learned to do either: asleep in the arms of a new woman. Christenings were funerals. Cradles were made altars. Not until their tenth year on a day four and one-half months after the oldest’s birthday and four and one-half months before the youngest’s birthday did the father reveal to the boys they weren’t borne of the same woman and that the woman they’d known as their mother was in fact mother to neither. And it wasn’t until this day in their tenth year that either brother had considered the differences between them, had even recognized there were differences between them other than their nine months’ difference in age. But these differences, once noticed by the brothers, seemed to them both fateful. That the oldest brother thought in shapes and in waves, the youngest brother in numbers and formulae. That the youngest brother had fingers that were thin and tapered and the oldest had hands that were meatlike and gnarled. That the oldest brother was brown haired and fast growing while the youngest brother wore blonde at the height of his pale flat body. That his young face was flat and round, while the oldest brother’s was sharp and angular like an adze. That the oldest was born out of an expression of pure ecstatic love between the father and the first mother, the youngest of something else—love, sure, for the second mother, but also grief probably, or bereavement. These differences in character, which some called distinctive, the brothers called separating and shattering. Like until this time they’d been faces on either side of a mirror, only now recognizing the other’s reflection as a mimic, only now realizing this glass between them wasn’t a mirror at all. And the oldest and the youngest each wondered, then, whether he was the one on the other side, on the outside, alone in the cold, staring in through this imagined window. In their house there was a real window, a window in the room they shared, and at night this window became a portal to the world outside. “Are you awake?” the youngest would ask the oldest. “Yes, but you shouldn’t be,” the oldest would answer. “You should go to sleep.” “Why do I have to sleep when you won’t sleep?” the youngest would ask. “Because I’m older and I said so,” the oldest would answer. Beginning late those nights in their tenth year, the brothers began to explore the world outside their family home. The youngest brother would pull himself through the window, slowly lower to the level below, gain a foothold on the frame of the kitchen window, and softly launch himself the last feet to the ground, careful to avoid the protruding roots of the maple that towered over their backyard. In the dark, the youngest brother investigated the fauna of the night, the owls and earthworms and foxes and bats that stalked the yards of all the children in the neighborhood. He stood in the middle the yard, licked his finger, and raised it to measure the force and the direction of the wind. He braced himself against the bank of their low-running backyard creek and dipped his toes to measure the depth and the temperature of the water. The creek was murky, strewn with rocks, and lumbering. It raged only occasionally, often in spring after the snowmelt, but most nights it lay slow and quiet as the rest of the sleeping neighborhood. The oldest brother, too, would pull himself into the frame of the same bedroom window. He would leap wildly to a near branch of the maple and swing himself to the tree’s trunk and shimmy to the ground, stripping bark and skin, absorbing splinters and surfacing blood. Except his night wanderings weren’t confined to the yard. In his tenth and eleventh and twelfth years, he rode out into the night on his bicycle; in later years, he ran; in later years, he rolled the family Plymouth backward and silent down the driveway and at the bottom of the driveway, turned the engine softly and drove a block before charging the headlamps. At first, this was all for exploration, then for adventure and thrill, then to meet friends who were expecting him and who he wanted to please, then for things he couldn’t do near the house, things that could only be done in the unwatched parts of the night city. He liked discovering places that had been abandoned by others. They became his spaces. They became places he was free to do anything he wanted, like smoke or hide. As a family, they measured time not in days or in weeks but in the father’s shifts and in pay periods. The father worked on a factory line, most often the day shift but sometimes the swing shift and sometimes the night. The factory ceilings were tall and corrugated and the floor was long and poured in gray cement tracked with yellow lines. Behind this there was a chaos of machinery. Steel was forged with pulleys and levers and pincers and gears, all of it bright and loud in its chrome and massive, a moving mass whose workings made sense only to the men who, like the father, had been there longest. They were, themselves, machinery, their movements critical to completing a process bigger than any one of them. Newer men only knew their own stations, their own specific tasks. These new men knew the cars they helped make as half-assembled strips of steel and pipes and blocks and steering columns, cars that couldn’t start because there were not yet keys. Whatever shift, whatever phase of the sun or moon the father could see through the factory window, the work was tedious. He had survived two wives and worked to support a third, and still the repetition and din of the factory would grind at his bones if he let it. Every morning as he left the third wife asleep in their bed, he would steel himself, stiffen his body against the day to come. And every night as he drove the freeway home, he would have to release it, the tension of the day that had passed. With age, it had become harder to steel himself, harder to know when to steel himself. Everything had become harder, at home with the third wife and the brothers and at work with the foreman and on the freeway in between. Other cars passed faster than seemed safe. Some days he felt invisible and other days he steeled himself so completely he felt skinless, bloodless, and chrome, like he was only steel. One night after supper, in his chair and switching channels on the television, his stomach wrenched and twisted. He felt his stomach harden. He poked at it and saw stars shooting. He couldn’t breathe and he slid to the floor. He woke for a moment under hospital lights on a metal operating table, doctors and nurses protected by gloves and masks and working inside him, no different from the men in the factory. In the moment he was awake, he wondered how it would feel to have a factory inside him, to have embedded within him the twisted, wrenching steel of the line. The next moment he was out again. He woke repaired, but frail and penetrable. The third wife made him swear he’d protect himself. And as soon as he was allowed, he returned to his place in the factory, up and running again on the factory line. At work, he began to wear shin pads and kneepads, a fire shirt and a smock. He wore plugs to protect his ears and goggles to protect his eyes and the sight and the sound of the loud factory floor was muted to him because of it, the factory floor taking on the tone of a trumpet and the colors of early spring—not the pastel pinks and blues and greens, but the soft shades of gray the sky would sometimes turn, the funnel streaks of white from the factory smokestacks that pressed up into the gray clouds as through sewer grates. Winter was a low shade of cold blue, and the areas outside the factory where the father would stand with a cigarette and a handkerchief during breaks adopted the flat, grainy colors of old home movies. For the father, it was comfortingly familiar. This life behind goggles, between earplugs, reminded him of times before the hard deaths of the women he’d loved, before he came to fear for this new woman, this third wife, to fear he may have some lingering death in the tips of his fingers and that soon there would be, there would have to be, the death of this woman, too. And then, inevitably, the deaths of these two brothers, these two boys who looked like him in different lights, who sounded like him in different words, who were like him and like their mothers. These brothers his last remaining alive relation to the women he’d lost. Maybe for this reason, he began to see life at the ends of shifts—life at home—the same as the factory. Too bright and too loud, too sharp in contrast and timbre. And so he began to wear the earplugs and the eye goggles at home, thinking that if he kept all life muted and dim, if he kept from reacting to his family world too harshly or too excitedly or too gravely or too anything, he might be able to spare these six happy eyes that greeted him each evening at the head of the driveway, these six eyes no longer blue and green and hazel, but safe gray. On drives home up the interstate, he had to adjust for new blind spots. He found there were spaces at his sight’s edge that held hazards—speeding cars or potholes or road debris, thrown-off remnants of past crashes or flung treads from the tires of Mack trucks. He could no longer hear horns in anything other than dim waves. Dinners were the same, his ovoid vision at the kitchen table restricted to one brother at a time if he chose to look at the brothers or to his wife if he chose to look at his wife or to his food if he chose to look at his food and, because of this, meals were more intimate somehow. Shower water became white noise and particle falls in the fog. Before laying down to sleep, he would stretch the strap of the goggles and scratch at the band-shaped impression on the back of his head, try to invert the impression left in his thinning brown hair. In the pre-sleep dark, his third wife would tell him about her recipes, her friends, her day, tell him her fears and her dreams, anything. Any topic it seemed to her they should talk about. The father had trouble identifying the shapes of these words, the shapes between them, the pauses between the ebbs and flows of her lilts and furls. But he felt in her brass tone and the soft tilt of her hips that she’d press toward him, against him, the only words he could imagine her ever meaning: “I desperately want a child that is all ours, only ours, only us. I would prefer a girl, though another son would do.” And every night he pressed her back, away. She threatened to leave once. He watched as she took her coat and her hat and stood near the door. He stopped her, held her close, let her feel the stretch of his goggles against her ear and the hard wheeze of his chest pleading for her not to go. She said she loved him and she loved the brothers like sons and for those reasons she would stay. There was the day at the factory the winch pulled and the line sped up. Parts of cars came swinging around faster than normal. Robotic arms charging the full weight of steel along the tracks in the floor like mad bulls in a ring, the faces of the men bright red in the scrambling. There was a loud grinding noise. The father, with his bolt gun and oil sprayer, adjusted without thinking, slotting bolts in chassis undersides faster and with sharper aim, with shorter and more brusque fits of motion. These muscles that were once his own and that had been changed by this factory floor, muscles that during his years here had settled into the soft flow of assembly line movement, their twitching fiber gears ground. These movements that had become engrained in him, but that had become long and laconic in the everyday repetition of the same task. Some days before this one, he thought of himself as conducting a symphony or banking a plane or a boat, swinging his arms through a fastball—some job that was not his, some life that was not his. Now with the speedup, these movements sharpened again, had to sharpen again, and the father again found in his muscles the precision that had brought him here in the first place, the unusual mind for perfection that had gotten him the job. This sharp sense of things he thought lost, or, at least, that had evaporated into ether, into a smell maybe but otherwise into nothingness. Suddenly, the sense returned and for the first time he could remember since the birth of the oldest son, he smiled. Others on the factory floor weren’t as quick to recover and the line swiftly swung free from order into confusion. Ratchets got caught in the machinery. Broken bodies began to stack at line’s end. The plant’s welders threw off tall spiking sparks from the tips of their torches, sparks that spat from the air and lit workshirt cotton. There were crushes of metal and language, orders, directions, flattened under the wincing scream of twisting and scraping. Busted, jagged metal falling in torn sheets and pilings. Warning lights flashed, alarms sounded, bright and guttural and acid and overwhelming, like at once they’d turned on all the lamps and horns at the front ends of these cars they were meant to assemble. The father didn’t hear or see any of this. There was just, in his mind, under cover of the plugs and goggles, the grainy crackling light and soft awe like the night the oldest son was made. The squint of the first wife. The electric tall of the soft short hairs of her skin. The soft leather of the bench seat of the Plymouth. The Independence Day fireworks. He woke from this dream on the cold cement ground of the factory smothered under a fire blanket and the weight of the shift foreman. His goggles and plugs had come off in the tackle, and he could see and hear it all now. He could hear the men yelling, “Everybody out! Everybody out!” He could feel the sharp, singing pain of burnt flesh on his forearms, on his neck, his back. The way his legs moved slower and stiffer than he knew they should. The outside was new and hard as well, and without thinking he pulled backward from the flame of his lighter, couldn’t bring it close enough, hard as he tried, to light the end of a cigarette. And so he just stood there with the others, watched firemen douse the flames, watched smoke and steam escape the factory in apocalyptic, cloudlike bursts that floated faster and more wildly than earlier days’ straight smokestack plumes. No one knew the cause for sure. Around the pool tables of the bar across the street, some of the men assumed it was conspiracy. The union contract had expired and the company was taking a hard line. Maybe the company saw a slowdown coming and had been speeding up the line a little at a time over some weeks as a way of increasing productivity and piling some backstock without paying for extra shifts. This event, the story went, was the unexpected end of their means, a catastrophe that was nothing more than everything they deserved. After the second round of pitchers, others of the men started thinking maybe it was sabotage, that maybe this was one man’s or several men’s attempt at persuasion, in which case “I didn’t see or hear nothing” and “I’m not one to say” is what each man said in turn. The father, his arms wrapped and his other burns salved but stinging, was maybe the only man who actually didn’t know or didn’t want to know. He had his own idea. Different from the other men, he saw something more meaningful and calamitous in the day. The sparks and the steel and the smoke. The smoldering factory remains. The untenable mechanisms of machines and industry. He saw them all as legends on a large map, an atlas of the end of times. And at home that night, he went to the basement and reached up above the dust-covered top of the cabinet in which he kept old boxes of things—boxes of memories of the women he’d loved before—and pulled down the brown leather bag that held his shotgun. The leather had gone stiff and cracked from nonuse. The pieces of the disassembled gun were dry and gritty, too, and the father spent that night in the basement’s low light with a can of oil and a white rag and he worked until each moving part had been cleaned and replaced. The next morning, with the factory under repair and the forecasted rain waiting for afternoon, the father took the brothers to the gun range and taught them how to shoot, the oldest brother taking three shots for each of the youngest’s one, the oldest brother concerned with the feel of it, the feel of the warm gray gunmetal against his cheek, the sweet smell of the powder, the force of the recoil, the youngest brother concerned with the speed of the wind, the size of the target to shoot, the distance to the target and the end of the field beyond. The father and the boys noticed the difference: that one should be so quick to draw and the other so loathe. This was all before the factory strike, before the union meetings in backrooms of bars during which the men made lists of demands and chose leaders, before the company called for wage cuts and the union started handing out strike pay, before negotiations broke and the men circled the plant, threatened anyone who’d cross. The father declined to march himself, his legs still slow. But rather than stay home, he drove a shuttle in the family Plymouth between union headquarters and the factory fence, carried fresh men and signs and sandwiches and beer, always in a short-sleeved shirt that exposed his scars, the jagged too-white patches of fallow skin where hair had been burned off and would never grow again. The strike lasted through the heat and humidity of the summer, the father sweating thick into the black of the Plymouth’s leather. He told none of the men nor the brothers nor the third wife how afraid he was for world’s end and how badly he wished for the comfort of his eye goggles and earplugs. How badly he did not want to seem meek. There wasn’t any religion in this fear. The father had never been a religious man. Mornings on the assembly line or at the strike line, he’d stand outside from the circle of those men who were religious, and he’d watch them pray for a safety and a happiness that, as far as he could understand, weren’t likely to come and wouldn’t be worth much if they ever did. It was just, he thought, the natural order of all things to end: as with the lives of plants and trees and wives so with the lives of the seas and the land, all Earth and the universe. And he couldn’t think after the end there would be anything more than blind black space like the space after the edge of a map. Once the contract was settled and all the men were back to work, the line restarted and the company pushed to cover the shortfall, to rebuild inventory lost in the fire and inventory unassembled during the strike, the line now almost as fast as the day of the fire and almost as wild. The men struggled to make numbers and everyone was still bitter. It wasn’t long before rumors of the factory closing began to spread, and the rumors spread almost as fast as fire. There were layoffs that emptied half the factory—the company started with the newest guys and worked their way up by seniority, stopping just short of the father. Layoffs at other factories in the city followed. Plants closed, companies ended. And with all these layoffs, there was a time then when, for the brothers, the daytime neighborhood grew full to bursting with fathers. Fathers at baseball games and school plays. Fathers in grocery stores and in line at the bank. Fathers in backyards playing catch or setting tea parties. Fathers fixing parts of houses that didn’t need fixing or trying to fix parts that were past repair and couldn’t be fixed. Fathers mowing already-mowed lawns, mowing them again and again leaving only small snippets of fresh grass blade tips as seed to plant and grow again, to grow thicker. Fathers played and fixed and mowed because there was nothing else left to do that they knew how to do and none of them believed there was anything new he could learn or that he wanted to learn, nothing more than assembling cars. The only thing more fearsome for fathers than the thought of the chaos of parts, of cars unassembled, was the thought of days spent sitting on couches, hours like parts left unassembled. For the father and the other long-timers who remained at the factory, though, layoffs meant doing the jobs of two men at once, working two stations at a time, assembling cars with only a skeleton crew. This factory was open but nearly closed, these men the only life in a factory in various stages of death, of death and rebirth or death and undeath. The father believed all along that an end was imminent. And, just as he thought, it wasn’t long before the factory closed altogether. In this time, when their neighborhood friends were taken away by fathers, the brothers saw less of each other. The youngest brother stayed closer and closer to home, stopped exploring the neighborhood and the yard, choosing instead to read and to watch the world through the window. The oldest brother went further and further from home, further away from this woman who was not their mother and this father who was not the same kind of father as others they knew. This oldest brother found friends in faraway neighborhoods near the water or near the rundown places, the dark alleys, of the city. There was once when the youngest brother and the oldest brother were together alone in the kitchen of the house, together at the table. The youngest brother had cereal because it was morning. The oldest brother had a beef sandwich he’d made for himself. The youngest brother’s pale face was lit soft by the glass-covered bulb overhead and the house felt cooler than usual. “No. It’s fine,” said the oldest brother. “You’ll be fine. You’ll figure it all out.” The oldest brother crumpled the paper towel on which he’d made his sandwich and stood. He stopped for a second like he had something else to say. The youngest brother looked up at him. “No, you’ll probably be fine,” he said and walked back toward the stairs to their bedroom. That was all they talked about then and the last time they talked or even saw each other for a week afterward. Then came the year of fires. Houses burned in this year and houses were abandoned in this year, houses the factory men could no longer afford and in which they no longer had reason to live. Families moved away. What houses weren’t burned for insurance stood empty or were torn down or were burned down too, these not for money but for the hell of it. Buildings all through the city were burned. Empty houses and shuttered factories and boarded-up stores and bars and historical buildings, historical buildings from the old city that no longer was, buildings preserved for decoration, buildings that were meeting places, libraries and restaurants and speakeasies. Most all of these buildings burned. Those that didn’t burn were tagged, sprayed over in long neon marks, some as art, but most as territorial claims or painted threats. What seemed like every night, their neighborhood would glow red with sparks and then flames that flashed and slashed and died and came undead in embers that popped and cracked until morning. Fall air smelled thin and sweet like burning wood. Breaths turned thick with ash. The youngest brother believed when he coughed he spat the homes of his few friends, that he spat wet woodsmoke. The other boys in the neighborhood disappeared with the houses, gone to wherever people who move away go. The oldest brother gone to wherever the oldest brother went. Their street grew quieter with new weeds pressing up through the asphalt cracks formed by winter and weeds pressing up into the yards around theirs. Weeds rising as houses came down. Weeds turning to wild weeds and wild grass and wild flowers, all in tall stalks that the wind would blow and bend. Most days, the youngest brother stayed inside. Though some days he would stand on the porch and watch the wind arc the weeds toward the lake and the river, watch the neighborhood bend toward water, this old neighborhood now going to prairie or rewilded frontier. The houses around them continued to fall until theirs was the only house left standing on the block, the only house left in the neighborhood that hadn’t been burned down or torn down or abandoned to nature, and at night after the city lights faded and the cars stopped rolling past, the animals took over. The backyard was all jungle whispers and whines with the occasional screaming call. The youngest brother lay alone these nights in the brothers’ shared room with the window open, waiting for the oldest brother and listening to the world outside. He’d loved to explore their yard when the neighborhood wasn’t wild. Now he wondered with this wild whether he’d ever have the courage to explore unfound spaces again, whether he’d ever be the first to see anything. And these nights he’d lay awake in his bed in the quiet of the house and listen for sounds and he’d call out to no one the names of the animals, one for each letter of the alphabet, each in the order of the alphabet—right or wrong, animals he hoped were there, wildlife he wished to find around them, dreamed to find around them. And when for a letter he couldn’t think of any animals he knew, of real animals, he imagined and named new animals, imaginary beings whose sounds grew from the weeds and wind and burnt timber and fallen steel of their city forest. Nights when the oldest brother stayed gone, the youngest brother worried. Some of these nights it rained and there was thunder and lightning and the radio news talked of floods, of low-lying roads washed out or interstate underpasses under water, of the river rising. When cold came, some of these nights it snowed and the first snow stuck high in the trees and the further snow fell further to branches, to bushes, and to the foundations of former homes. Snow stuck to bent reeds and flowers. Snow fell to the ground, covered their lawn in white, covered the forest floor. And these nights the youngest brother wondered whether the oldest brother had meant to come home but had somehow gotten lost, lost his tracks, like the oldest brother was a fairy tale Hansel, alone and afraid and crumb-less. The youngest brother feared he’d failed his brother somehow, left him lost, let him go. The father’s fears were different. The factory and the forest. Their neighborhood embers. The absence of the oldest. The floods. All of it, the father feared, was his fault, all of it the result of this evil he believed he possessed, and, if not evil, this bad whatever-it-was. The eye goggles and the earplugs no longer helped. Even in their smooth, safe remove from the world around him, the father decided, he still hurt all he loved, whether in pregnant birthdeath or in starvation and abandonment. It was the world that needed earplugs and eye goggles, he believed, to protect against him. To him, the close of the factory was another sort of legend, the last lines of life’s atlas: give of yourself before all else is taken. He didn’t sell or burn the house. He didn’t leave. He gave himself. First, he took a day off from work and drove the brothers and the third wife to the river. They parked the car and they boarded a steamer ship that steamed them out to an island in the strait, to the amusement park. And that afternoon they acted as a family. The father bought ride tickets and funnel cakes. They visited the zoo and took a gondola to the top of the Ferris wheel. They rode the Wild Mouse, the Sky Streak, the Nightmare, the Screamer, and the Falling Star. The park had a railroad that ran along the water, and they watched the boats on the river and the falling city across it. The father bought souvenirs for the brothers. He took a strip of photo booth pictures of himself for the third wife. And late that night the father went to the basement. This night in the basement there was just the quiet of the lone light bulb hanging from the ceiling. The father with his scarred arms out in front of him, his legs tucked under. His eyes covered. His ears plugged. There was the crack of a shotgun flame no taller than the lighter that no longer lit the cigarettes he would not smoke. There was the impression of the goggles’ strap inverted. The third wife was asleep. The oldest brother was away. 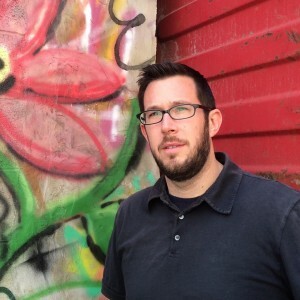 MATTHEW FOGARTY’S work has appeared in Passages North, Fourteen Hills, PANK, The Rumpus, Midwestern Gothic, and elsewhere. He has twice been a finalist for the Write-a-House residency, and has received scholarships from the New Harmony Writers Workshop, the Wesleyan Writers Conference, and the Squaw Valley Community of Writers. He earned his MFA at the University of South Carolina, where he served as the Editor of Yemassee. Currently, Fogarty is a Co-Publisher of Jellyfish Highway. He is originally from Troy, Michigan, one of the square-mile suburbs of Detroit. 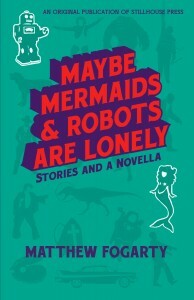 Adapted from Maybe Mermaids & Robots are Lonely, by Matthew Fogarty, Copyright © 2016 by Matthew Fogarty. With the permission of the publisher, Stillhouse Press. Ran to Amazon and bought the book, been picking through it. Your images are crystalline, like that one of the bough bursting through the fog & back. You’re on my list.